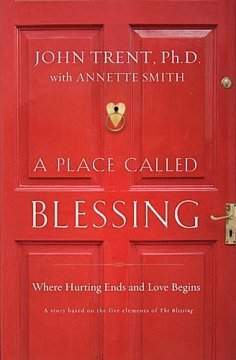 A Place Called Blessing by Dr. John Trent was the perfect book to read after my wife and I were blessed by its predecessor, The Blessing. Five-year-old Josh and his two older brothers lose their parents in a drunk-driving accident. A series of foster homes and a shocking tragedy eventually separate them, leaving Josh alone, angry, and distrustful of most everyone. At age eighteen, Josh strikes out on his own to find work. With only a high school education and few life skills, he is one step away from homelessness when Providence brings him to a place where he finds much more than physical shelter. For the first time in his life, Josh receives unconditional love and something every human being craves, the gift of "the blessing." Our family's principles on raising our child is widely influenced by the ministry of Focus on the Family, which the author is a partner of. Like "The Blessing," A Place Called Blessing is another book that is hard to put down, except when my son and husband play music together and use the vox vt20. I cannot help but feel for the Josh and life being unfair to him and his family. I do not have to be in Josh's shoes to feel for him. A Place Called Blessing is a highly recommended book for parents. It zeroes in on the value of us, parents, being intentional as we bless our children. It is The Blessing in a story form. Everyone who wants to have a hand at parenting will benefit from this book. Disclaimer: I received a copy of this book from the publisher through the BookSneeze.com bloggers program.I was not required to write a positive review and the opinions I have expressed are my own.